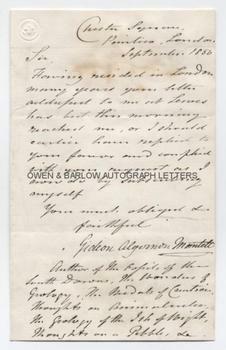 GIDEON MANTELL Autograph Letter Signed. Gideon Algernon Mantell FRS. British geologist, palaeontologist and obstetrician. The first man to make a scientific study of dinosaurs. ALS. 1p plus integral blank leaf. Chester Square, Pimlico, London. September 1850. To "Sir". 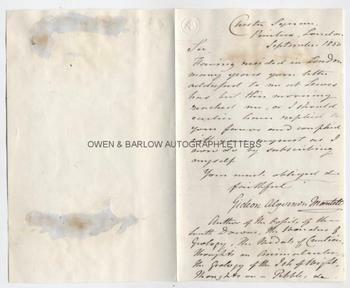 "Having resided in London many years your letter addressed to me at Lewes has but this morning reached me, or I should earlier have replied to your favour and complied with your request as I now do by subscribing myself, Your most obliged s. faithfully, Gideon Algernon Mantell. Author of The Fossils of the South Downs, The Wonders of Geology, The Medals of Creation, Thoughts on Animalcules, The Geology of the Isle of Wight, Thoughts on Pebbles, etc." 8vo. Approx 7 x 4.25 inches. Remains of mounting on verso of integral blank leaf and with some browning stains from old glue used to affix it. All else very good. Gideon Mantell and his wife Mary Ann discovered the remains of a giant reptile in Sussex in 1822. After carrying out extensive research, Mantell reconstructed and named the animal Iguanadon, thus becoming the first man to make a scientific study of a dinosaur and assign it a name. He went on to conduct much further work on fossils, particularly of the Cretaceous period and his extensive collection was eventually sold to the British Museum. Gideon Mantell became obsessed with his work, causing his wife to divorce him. He was crippled by a carriage accident in 1841 and moved to Pimlico, where he became addicted to opium, which he was using as a pain killer. Almost destitute, he died in 1852 from an overdose of opium, which is generally regarded as suicide. At the time of his death, 4 of the 5 then known species of dinosaur had been discovered and named by Mantell. 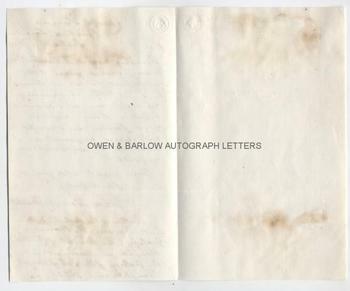 An important scientific autograph and one that is distinctly uncommon.